This story appears in the October edition of Ottawa Magazine. Buy the magazine on newsstands or order your online edition. If you’re one of those non-believers who think a cup of coffee is just a cup of coffee, well, it’s time to wake up and smell the coffee! The city’s coffee culture is taking off in a powerful way with a new wave of coffee shops dedicated to the craft of making the popular brew. In June, local café darling Bridgehead infused the burgeoning scene with its biggest jolt to date, opening its very own roastery. The creation of the new company HQ and coffee shop location number 15, set in a historic building in Little Italy, puts the process of bean to cup on eye-dazzling display. Caffeine fix: Ian Clark (centre), Bridgehead's director of coffee, is dedicated to helping each customer find his own private coffee nirvana. Photography by Doublespace Photography. The bells and whistles in the impressive $3-million facility are anchored by the showstopper of a centrepiece: a 6,000-pound coffee-bean roaster. But the new roastery serves not just as a cool place to grab a beverage and a bite but as an opportunity to see the whole story of your ultra-fresh cuppa joe come to life (especially when you take a Saturday-morning tour of the facility). The staff are well-versed in the world of flavour profiles and brewing methods and can answer any burning coffee question you might have. Step up to The Brew Bar, and prepare for a brain-bending sensory experience that might bring back memories of high school chemistry class. In addition to your favourite espresso drinks, imagine a new universe of drip coffee that tastes naturally of blueberries or peaches. 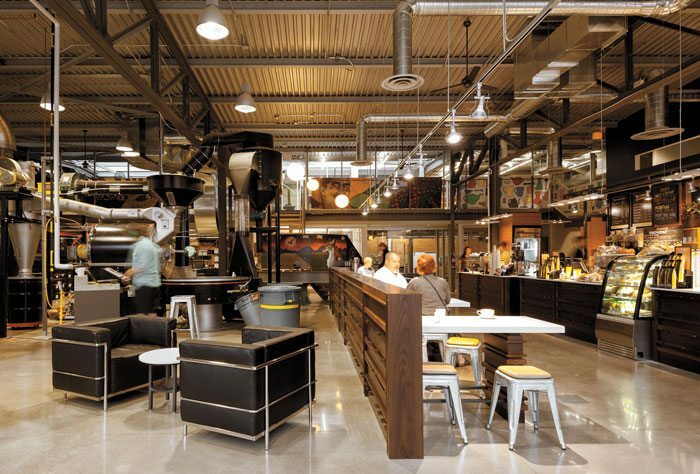 Bridgehead Roastery, 130 Anderson St., 613-231-5488, www.bridgeheadroastery.ca.